Finally it's summer and I can wear shorts! Even though the weather in England is way below satisfactory, I will brave the rain and wear shorts :) In this post I'll go through how I personally style my shorts and show you how you could too! For either night time or a slightly more smart event, this outfit would be perfect. The striped shirt has an office/work type feel to it, whilst the scalloped shorts adds a playful aspect to the outfit! For when the weather is still warm, but the sun is down, a loose crop top with a pair of shorts is best. The crop top is still airy and summery, but the longer sleeves also provides some warmth. I also love the ripped effect on the shorts, and the slightly highlighted blotches which makes the shorts look well-worn and relaxed. This outfit is a very casual and summery look, and I like the double denim look! This one isn't too obvious because of the different colours, so if you're not too sure about double denim, its a good place to start! 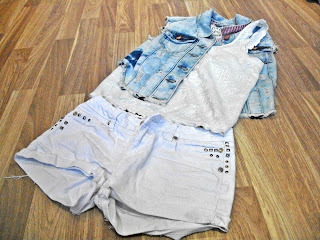 Because the top and shorts are both white, add more colour into the outfit e.g. neon shoes, or the blue denim vest! In this outfit, I wanted to mix&match prints, to make it more interesting. A tip for mix&matching prints would be to choose 1 dominating print and the other a smaller print, so that they don't clash too much! The high waisted design means that not too much of your midriff would be on show, making it summery but still tasteful!